Why do consumers ask for bakery products that are free from egg? Health- and sustainability-conscious consumers are driving the “free-from” trend by asking for egg-free alternatives. Numerous recent public health concerns, such as avian influenza and fipronil contamination, have also increased the importance of egg replacement. Moreover, egg is a costly ingredient with considerable supply and price fluctuations. Being able to partially substitute eggs helps to buffer raw material shortages while guaranteeing a constant quality of baked goods. Replacing eggs can be very challenging, as they are an essential, multi-functional component in many fine bakery products. Egg has a major impact on fine baked goods, from the processability of the batter to the determination of quality parameters such as volume, texture, taste and shelf-life. Is there a solution for 100% egg replacement without quality deficits? Yes, there is an innovative solution for replacing up to 100% egg in cake and other fine bakery products: α-cyclodextrin. This naturally occurring oligosaccharide is made from starch and can be obtained from WACKER under the trade CAVAMAX® W6. In combination with water and protein (either plant or dairy based), α-cyclodextrin represents a solution for up to 100% egg replacement in ready-to-use powder mixes or final baked goods that still fulfill the quality and sensory expectations of consumers. α-Cyclodextrin allows manufacturers to replace egg without compromising on product quality and can simply be added to powder premixes for easy handling. In comparison to egg, which can be difficult to handle, α-cyclodextrin allows producers to employ a leaner HACCP management. Because it has no major influence on batter pH or viscosity, α-cyclodextrin can be used on existing equipment and production lines. Replacing egg by α-cyclodextrin can reduce costs by up to 40% and additionally provides a buffer for seasonal egg-price deviations. α-Cyclodextrin improves batter aeration and the stability of fat droplets and gas cells. The synergy of α-cyclodextrin with proteins stabilizes the texture and retains the moistness of the final baked good. 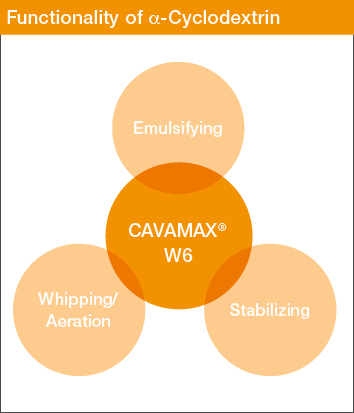 The graphic on the left summarizes the functionality of α-cyclodextrin (CAVAMAX® W6) in bakery products. Eliminating egg in a cake typically results in reduced volume and elasticity. α-Cyclodextrin compensates for the loss in elasticity, as shown in the graph below. The sensory parameters of cake made with α-cyclodextrin are likewise very similar to those of the egg-containing control. Variations in color can easily be adjusted by adding beta-carotene. Left: Elasticity of pound cake crumb measured via texture profile analysis. Cakes with partial (50%) and 100% egg replacement contain α-cyclodextrin (CAVAMAX® W6). Protein and water content have been adjusted accordingly. Right: Sensory analysis of pound cake with egg and 100% egg-free (egg replaced with 1% CAVAMAX® W6 α-cyclodextrin); adjusted protein/water content. CAVAMAX® is a trademark of Wacker Chemie AG. Dana Elgeti graduated from Technical University of Munich (TUM) with a PhD in Food Technology about the optimization of gluten-free bread production. She identified new strategies to aerate gluten-free dough systems with alternative raw materials and published her findings in several peer-reviewed publications. 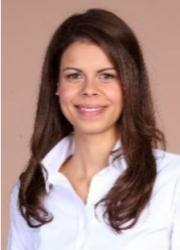 At WACKER, she is now in charge of Global Marketing for the company’s ingredients for food and dietary supplements.